Fifteen years have passed since the intensification of violent conflict in Sri Lanka. The first to suffer have been children. In the aftermath of the Krishanthi Kumaraswamy case, Kishali Pinto Jayawardena looks at the questions being raised. In the post Otunnu period, what is clear is that Sri Lanka is now being looked upon as a classic case study for documentation of the ravages of children in armed conflict. Take the case of Otunnu's visit to Sri Lanka in early May this year. His seven days in the country was a prime time event for both the Sri Lankan Government and the LTTE, both of whom made extravagant promises. Indeed, in a recent headquarters briefing in New York, Otunnu outlined some of the main benefits arising from his visit. For the first time, the Government and the LTTE were said to have made definite humanitarian commitments. 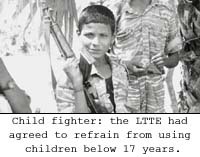 The LTTE had agreed to refrain from employing children below 17 years. They had also agreed to the monitoring of these promises. Asked by a journalist as to how this could be monitored, Otunnu replied that the precise mechanisms remained to be decided. The Government meanwhile reiterated its commitment not to recruit or deploy children below the age of 18 years. Both sides had however refused to commit themselves on the question of the use of landmines in war. Given that this remained a serious concern with Sri Lanka being one of the most mined countries in the world, the UN Special Representative on Children in Armed Conflict pointed out that this would remain a priority on his list of concerns. These, then, are the promises. Let us now turn to the reality, horrifyingly documented in a recent publication released by Amnesty International.
" Fifteen year old Raja (pseudonym) went to the Teaching Hospital in Jaffna, Sri Lanka, complaining of insomnia, aggressive outbursts and irrational abnormal behaviour in late 1994. He had joined the LTTE at the age of 11 and underwent extensive training. He told doctors that after one attack where he lost many friends, he was shown videos of dead women and children and told that his enemies had done this. Soon afterwards, he was involved in attacks on several Muslim villages, near Batticaloa. When recounting one attack, he described how he had held a child by the legs and bashed his head against a wall and how he enjoyed hearing the mother screaming. He said they deserved to die." Raja, whose story is described above was one of the many recorded child fighters within the LTTE which began recruitment of children into their cadres as a systematic effort in the late 1980s with the occupation of the North by the IPKF. His experience shows the hurtful vulnerability of children brainwashed by the LTTE to become their tools of war. In June 1995 teachers and parents attempted to resist the enlistment drive of the LTTE but were met with death threats by them. Meanwhile, children belonging to the Sinhalese and Muslim communities have been deliberately targeted and killed by the Tigers as in May 1995 when six children were among 42 civilians killed at Kallarawa, north of Trincomalee. Other documented studies on Sri Lankan children contained in the Amnesty International publication "Children in South Asia - securing their rights" are equally shocking. "Amirthalingam Surenthran, a 13 year old student and his 17 year old brother Amirthalingam Jagendran were among eight civilians deliberately shot at close range by police and home guards at Tampalakamam, Sri Lanka on 1 February 1998. They had attended a house warming party the previous evening in a house near the police post at Pokkuruni, a hamlet of Tampalakamam, Trincomalee district and had decided to stay the night. At about 6.30 am, around 20 police and home guards who appeared drunk, dragged them out of the house and reportedly took them inside the police post and shot them. Although at the time of writing, the motive for the killing had not been established, villagers suspected that they may have been in reprisal for the killing of 13 civilians during a bomb attack on the Dalada Maligawa (Temple of the Tooth) in Kandy-(it is noteworthy here that) the 13 civilians killed during this bomb attack were reportedly all pilgrims. Among them were five members of a family from Embilipitiya, Ratnapura district, including two children, one aged two and the other, seven." In a weighing of the scales, the state is also held accountable in the manner in which it allows innocents caught in the crossfire of the conflict to be victimised. The Amnesty International report says succinctly that what is of particular concern to Sri Lanka is the phenomenon of 'disappearances", including that of children. No less than 68 children were among over 160 villagers from the the Saturukondan area in Batticaloa who were taken away by soldiers attached to the Boys Town army camp on 9 September 1990. Their cases, along with several other children who 'disappeared' from the South and other parts of the country during the counter insurgency operations against the JVP have been investigated by presidential commissions of inquiry, on whose reports action is yet forthcoming. One account by an 11 year old Tamil boy about a month after he was tortured at a small army camp near his home in Jaffna is particularly saddening . "Two soldiers threw me in a tub which had no water in it. I got up and ran to my mother at the gate. I held my mother and asked her not to allow them to take me. They snatched me away again. I was put against the wall and one of the soldiers kicked me with his knee in the stomach. I screamed. Then they took me behind their compound. There was a coconut tree. They tied my legs with rope and pulled me upside down. While hanging, I was beaten with netted (twisted) wire about six times. Then they let me down and tied my hands. I was beaten with sticks from the tulip tree." He had been beaten because the soldiers suspected that his family had provided food to members of the LTTE. When relating his experiences, he still had the marks of beatings on his buttocks. The soldiers eventually let him go, warning him not to tell anyone about his treatment. His mother did not dare to get medical care for his wounds. In another such documented instance, Kumar, a 12 year old boy had arrived in Colombo with his ailing father from their village in the north of the country in November 1997. His father was admitted to hospital almost immediately for special medical treatment. On 14 November, while at his father's bedside in the hospital, Kumar was arrested by the police and taken to the Maradana police station. The police accused him of links with the LTTE, pointed a gun at him and " threatened to break his head on the ground" and "pour water through his eyes and nose". Over the next days, he was stripped and beaten repeatedly with a broken wooden bat. They told him that his father had died. Five days later after his arrest, Kumar was admitted to hospital with stomach pains and discovered that his father was still alive. A subsequent medical examination showed that Kumar had injuries consequent with being assaulted with a blunt weapon while his hands had been tied below his knees. Amnesty International noncommittally records these instances, calling on the state and the LTTE to respect international obligations to respect the rights of children. It also cites two instances where swift state action was taken against perpertrators of abuses, one being the Krishanthi Kumarasamy case. The other is quoted to be in 1997 when the Supreme Court ordered record compensation to be paid to Bathatha Jayatunge Gamage Malsha Kumari who had been tortured by police in Hungama, including being hung by her wrists from a tree. These instances are, of course, prefaced by the caution that the taking of effective action such as in the Kumarasamy case is the exception rather than the norm. This then is the reality. It is also a reality not only in the theatres of war in the North but in the other areas of the country, happening with a lazy arrogance in the heart of Colombo, amidst the day to day activities of decent civilians who would undoubtedly be shocked out of their wits if brought face to face with it. The latter then is the more dangerous manifestation of the two. If our collective apathy about these incidents is not checked, the visits of international observers to the country can only be occasion for rhetoric. That has been the pattern of the past. There remains little to be said for us as a people if the same continues to be said in the future. More Plus * How do Sri Lankans eat?